Frank Nester is a small time criminal who manages to pull off an almost faultless railroad robbery, except for a burnt hand when he grips a stovepipe to steady himself. This injury points to his presence in the mail car and sees him taken into custody. But luck is on his side and the jury find him not guilty, much to the annoyance of special agent Rodney D. Dodd. So when an almost exact duplication of the robbery occurs two years later for a haul of cash that is nearly forty times greater, Dodd sets his sights on Frank. However, this crime includes a killing. 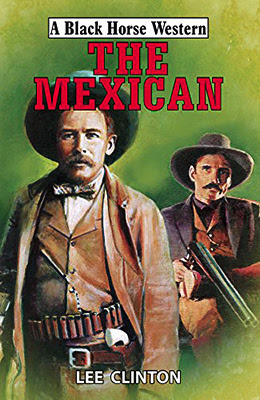 A Mexican jeweller by the name of Don DeLuca, who was travelling in the first class compartment, was hit by a stray shot. Dodd says it’s murder and that Frank should hang. Frank knows he had nothing to do with the heist. So who did? And what has happened to the body of Don DeLuca? Lee Clinton has certainly come up with an excellent story that offers plenty of twists and turns as Frank begins to piece together who did the crime he has spent years in prison for. Frank will be helped by his old partner and his lady. In fact it is this lady, Sarah, who is the driving force behind Frank’s attempts to solve the mystery of the robbery, killing, and missing body. Sarah seems to know all the questions they need to find the answers for and when Frank asks her how she knows this, her answer put a big grin on my face and knocks Frank’s confidence in her a little. I’m not going to spoil her reply here, you’ll have to read the book yourself if you want to know. As each lead throws up more puzzles, and a major breakthrough seems to present itself, only to die in front of them before revealing the answers they were hoping for, you have to wonder if the mystery of the robbery will ever be solved. Throughout the story Lee Clinton inserts little clues and red-herrings that’ll make you think you’ve worked out the who and why but then you’ll find yourself changing you mind again and again. The story builds extremely well to a final bloody confrontation the ties up all the story-threads and once again left me looking forward to Lee Clinton’s next book. Some of you may have noticed that the Black Horse Western line is no longer published by Robert Hale and are now being published by The Crowood Press. Crowood are now publishing all these books as ebooks too. GP Hutchinson once again comes up with the goods in this, his second Emmett Strong western. It begins shortly after the last book ended and continues the threads left hanging at that books conclusion. Once again the theme of racial prejudice plays an important role throughout the story and Hutchinson puts this over well. If that isn’t enough of a problem for Strong he also has to try and clear his name of robbery and then there are those coming gunning for him he doesn’t know about. All these storylines grab the readers’ attention effortlessly making sure you’ll continue turning the pages. “Three-Finger” Ned Cage is a well thought out character who proves to be an excellent adversary for Strong. If you want to know why he’s called “Three-Finger” you’ll have to find out by reading the book. Although this book can be read, and enjoyed as a self-contained novel it might be advantageous to read the earlier book, Strong Convictions, first so you know exactly how the characters came to be in the position you find them in at the start of this one. On reaching the final page I was once again left looking forward to discovering what GP Hutchinson has in store for Strong in the next book of the series. 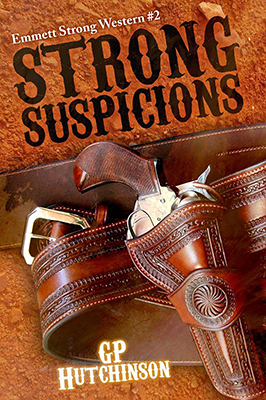 GP Hutchinson recently won the Western Fictioneers 2016 Peacemaker Award for Best First Novel (Strong Convictions).